Our book is now out on Amazon (Global), Google Play and iBooks (iTunes, Apple) ! One problem foreign investors face, in fact, is the crucial lack of dependable, actionable information about Japanese properties. In the Savvy Foreign Investor’s Guide to Japan, real estate advisor and investor Toshihiko Yamamoto and U.S.–trained global architect Masatoyo Ogasawara tell you exactly how to find, assess, buy, manage and even build great properties in Japan—and how to avoid all the pitfalls along the way. Whether you’re a pure investor, have plans to live in Japan or are already here, this book gives you several potential roads to solid yields in one of the world’s most stable and desirable property markets. We can gift you our e-book ! We can send our e-book as a gift either to your Amazon.com (Amazon USA) account or iBooks Japan (iTunes, Apple) account. contact email address which you use with Amazon USA or iBooks. You can apply for the gift only once and need to chose either Amazon.com or iBooks, Japan. Our questionnaires will be sent upon your application. If you wish to receive our e-book in Japan, we recommend to chose iBooks Japan. We are now offering Amazon Kindle version e-book as a gift to those who can provide the answers to our short questionnaires. You can read our e-book (Amazon Kindle format) on your iPhone, iPad, Android, Mac and Windows PC by Kindle Apps even if you don’t own your Kindle hardware device, however, please note that you cannot use Kindle device or Apps which is linked with Amazon international territory (eg Amazon, Japan) for redeeming a gift and downloading the content. To redeem our gift and download the content, you have to re-do the setting of your device and Apps and access Amazon.com account (Amazon USA account). We will send you our short questionnaires and a guidance as soon as we receive your request for a gift. After we receive your full and complete answers to our questionnaires with your appropriate email address, we will send an email to download our e-book by Amazon Kindle format. If you would like to receive our e-book as a gift please contact us. We can give our e-book “The Savvy Foreign Investor’s Guide to Japanese Properties” available in the Kindle Store (Amazon USA only) as a gift to anyone with an email address.You can receive a Kindle book as a gift even if you do not own any Amazon device. Recipients can read a Kindle book gift on a supported Amazon device or Kindle reading app. When you receive a Kindle e-book as a gift, you can accept it immediately and read it on your supported Amazon device or the Kindle reading app. You can receive Kindle books as a gift even if you do not own a Fire tablet or Kindle device. If you do not have a supported Amazon device registered to your account, you can download a free Kindle reading app on your iPhone, iPad, Mac, Android and Windows PC after you accept your gift. *Again, your Kindle device and Apps need to be linked to your Amazon USA (Amazon.com) account when redeeming a gift and downloading the content. This is because of Amazon’s policy. Click Get your Kindle Book Gift Now from the gift notification email to view your gift on Amazon.com. Click Accept your Kindle Book Gift and, if prompted, log in to your Amazon account.Tip: If you’ve received a Kindle book gift at an email address that is not associated with your Fire tablet, Kindle e-reader, or Kindle reading app, click Use a different Amazon.com account and sign in to the account where you would like to redeem your Kindle book. *You can apply for the gift only once and need to chose either Amazon or iBooks. When we give you our e-book (digital book) from the iBooks store (Japan) as a gift, it’s easy to download and access the content. for your digital book. Copy this code. 3: Open up the iBooks,(Japan) program on your device. After that, click on Store. Move to the bottom of the page and click on Redeem. Look for the section of the page that says, ‘You can also enter your code manually.’ Click on that text. go back to Step 2 above and try again. Once the code appears successfully, click Redeem. 5: As soon as you’ve completed the final step, your gifted e-book will automatically appear on your iBooks shelf. for you on the iBooks bookshelf in no time. as a gift in US, please select Amazon.com (Amazon USA) option. After you read our book, it would be great if you could leave your reviews on Amazon or other platforms. We wrote this book for those who are interested in Japan, Japan’s real estate and architecture. When we write a book, we have a particular reader in mind. We also make some assumptions about the reader and what that reader is looking for. Here are a few assumptions we’ve made about audience. 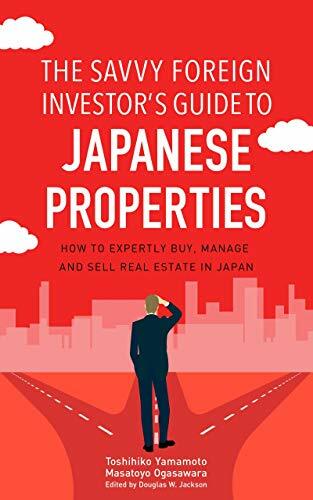 1.You’re looking for a way to invest in real estate in Japan but don’t know who you should talk to, what types of properties are the best. 2.You’re considering buying an investment property in Japan, be it a condo unit, a small residential building, or akiya (abandoned house), but your real estate experience in Japan is limited and you don’t have local network who supports your investment. 3.You may have bought your home (your home is the real estate investment ! ) or a small amount of money already invested in your home country but you’re ready to go after bigger properties to diversify your portfolio. We are happy to be your tour guides for your real estate investment in Japan. Throughout this book, we emphasize four fundamental understandings that we believe to be true. 1.Real estate is one of the best for ordinary individuals of varied economic means to build the wealth. 2. Investing in real estate does not require the rocket science but does require doing the homework. The principles in Japanese market work exactly the same as other developed countries’ but there are some local barriers and rules you need to watch for. If you are not doing your homework properly, you would be more likely to end up with bad properties or excessively expensive properties. 3. Any investments such as stocks, bonds are not risk free. Real estate investment in Japan is not the exception. Although you should make money over decades investing in good real estate properties, you could lose your money, especially in the short-term. Don’t unrealistically expect real estate values to increase every year in Japan. Instead Japanese real estate provides more stable income gains rather than capital gains. 4. Some real estate agents are bad and rogue in Japan. immediately without the proper background check. Your agents are supposed to be your trusted partner but sometimes it is not a case and they think you are an easy mark. If you would like to receive our e-book as a gift, please contact us. Toshihiko Yamamoto was a corporate executive working for major firms such as Konami Corporation and Sony Pictures Entertainment and a commodities trader in London for five years before getting deep into the real estate market as an investor, real estate broker and property advisor. He’s determined to raise the reputation of real estate investment in Japan, and specializes in assisting foreign buyers and sellers the market.